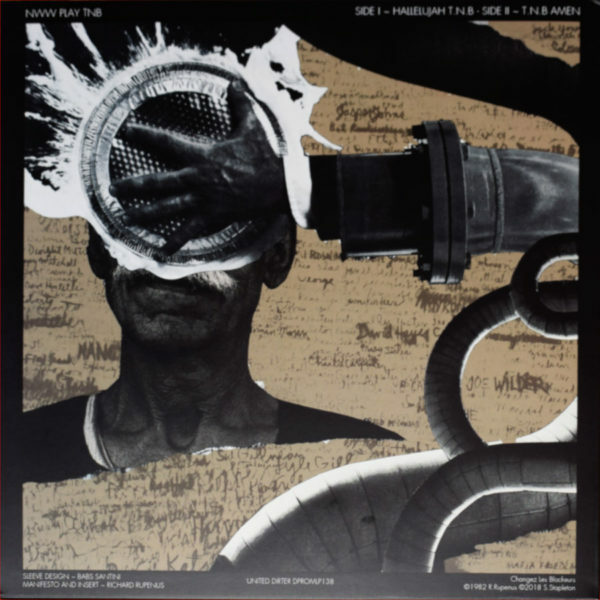 Here we have the meeting between The New Blockaders and Nurse With Wound on an album (UNITED DIRTER DPROMLP138) released jointly by United Dairies and Dirter Promotions (Steve Pittis’ label of dark industrial sounds, active since the 1980s). Actually I see that the hybrid entity United Dirter has been active for at least ten years unbeknownst to me, and there’s a slew of Nurse With Wound related items in the catalogue. For purposes of my own sanity as I write this, I’ll remind myself that human beings are involved behind these names, Richard Rupenus (TNB) and Steve Stapleton (NWW). It’s a handy, if not downright Burroughsian coincidence, that both names abbreviate to three-letter acronyms. 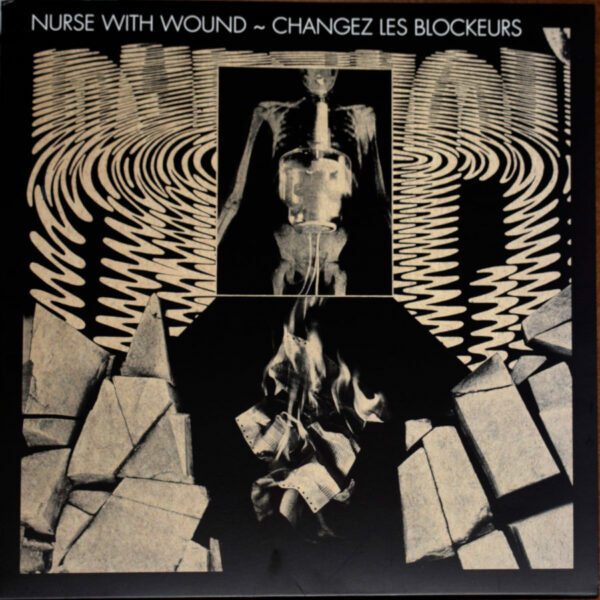 The front cover seems to privilege Nurse With Wound as the main artiste, but the back cover refers to this as “NWW PLAY TNB”. From one angle, this might be understood as a “remix” record, though most of the printed literature calls it a “reworking”. I’ll assume it’s Stapleton who has done most of the reworking, and that the source he is transforming is Changez Les Blockeurs, the debut album by The New Blockaders. Changez Les Blockeurs was originally released in 1982, in a small edition of just 100 copies. (I don’t think I ever heard it before I was sent the Gesamtnichtswerk box set in 2002.) While I haven’t looked too deeply into its production, my understanding is that the noise was produced by shifting furniture around and striking multiple non-musical objects; I’ve often found the noise of TNB to be largely insufferable and grim, and have not seen any significant advance in the progress of their music since this debut record. But that’s entirely beside the point. The crucial force behind the Rupenus project is nihilistic energy, a focussed intent to destroy culture by any means possible. Some of the message is delivered by rhetoric, a series of slogans which by now (I have been obliged to read them several times over, with the amount of reissued and collaborative product I’ve been sent) is becoming wearisome and one-dimensional. No use attaching more exclamation points to these shouty proclamations; it doesn’t make them any more true, or effective. However, I do recognise that TNB have managed to occupy a very singular niche in the margins of musical history, and held the position against all attackers. It’s not insignificant that the title of this 1982 LP refers to a “blockade”; Rupenus might align himself with any number of historical sieges and barricades, either political, ideological, or cultural (though probably not religious), and identify with those uncompromising souls who have found themselves driven to this stark either/or point by the tyranny of the enemy, where no middle ground is permitted. Looking on Discogs today, I find the title Changez Les Blockeurs was added at the eleventh hour, which is why it isn’t printed on the cover of the original album. It’s as though a core part of Changez almost went missing. That seemed meaningful to me somehow, in the context of today’s record; Stapleton has likewise managed to “efface” elements of the original album through his interventions. On the A side, called ‘Hallelujah T.N.B.’, we can hear to the front of the mix the now familiar non-music of TNB – chugging, clanking, grinding…it’s got that “stubborn lawn-mower” effect which I personally use as shorthand for the TNB signature sound. I like the idea of antiquated lawn equipment, rusted and unusable, being pressed into service on what is probably an overgrown mess of crab grass and weeds. But NWW has also inserted a background sound which only became apparent to me after a couple of spins; it’s barely there, a ghostly whisper of a washed-out drone, but I sense it has the Stapleton fingerprint of non-natural eeriness on it. (Not that I’m an expert; I’ve gone out of my way to avoid delving into the Stapleton Omniverse of pseudo-surrealism.) Side A, while unchanging for its duration and thoroughly depressing, becomes somehow tolerable through this effective sandwiching of elements. I’m calling this the “noisy” side, in order to distinguish it from Side B. Side B, called ‘T.N.B. Amen’, is far quieter. The surface is still abrasive, but it exudes a world-weary resignation (I certainly won’t use the word “calming”) which marks it apart from the flip. It exudes a deathly, poisonous menace. It is also not like any TNB record ever endured by me, and I think it’s simply because it contains a pulse, a rhythm. I’ll assume this also supplied by Stapleton; rhythm of any sort has been anathema to Rupenus, and his records have studiously avoided it, mainly through a devoted adherence to pure chaos. Rhythm is probably one of the many things on his “hate” list, one of the musical and artistic conventions which he is out to destroy. Despite this tension, Side B emerges as a successful piece of sound art, and I suspect is true to the overall intention of this reworking project. Note the words Hallelujah and Amen in the titles; despite my saying religion was not a theme embraced by Rupenus, here’s some scant evidence to the contrary. It’s more likely of course to refer to the “cult” of TNB, and the cult of “Industrial” music in general, which over time has attracted its hard-core adherents who are probably more intractable about their beliefs than any given fundamentalist. And the words are undoubtedly used ironically, by two major players who can afford to poke fun at themselves and their own legacy. And of course it undermines the beliefs of the established church right at its foundations, when the 21st century idea of a Hallelujah chorus is this brutalising concrete cacophony, and the idea of an “Amen” is a long desolate sigh of despair. I’ve no idea if any of this commentary of mine helps. You’d probably be better off reading the annotation by Paul Hegarty, who has written extensively on the genre of Noise music, makes noise records himself, and ran the DotDotDot Music label to release prime examples of it by international stars. Hegarty contextualises the point of this record better than I can, as he understands more about the history of NWW and TNB and the relevance of Industrial Music; while indicating they are arguably progenitors of much that followed, he stresses that they both stand apart from it as a genre, which is highly plausible. Reading his notes made me think of this LP as some sort of meta-music, a commentary on musical history presented in aural form; but then it starts to look incestuous and self-congratulatory, which it emphatically is not. On the other hand, the verso of the printed insert is self-referential to some degree; the TNB manifesto, with all exclamation points intact, is printed with a NWW cloud floating across it, in direct homage to the typography of the infamous Nurse With Wound list from 1979. I can imagine those hard-core adherents nodding their shaved heads in appreciation of this in-joke. Re-reading what I could of the manifesto (certain words are obscured by the black cloud), I noticed the frequent repetition of the word “new”. I’d forgotten about this, but in 1982, TNB were calling for “new” everything – new futures, new ideologies, new ways of thinking. That sounds positive, in complete opposition to the sheer destructiveness of their hateful noise. I’d venture to say that with this reworked LP, the “newness” promised by The New Blockaders has finally been delivered, with the judicious help of Nurse With Wound. And lest I get too serious, let’s recall that the back cover collage (by Babs Santini) shows a hand delivering a pie in the face to a moustached man who may represent any pompous authority from the bastions of culture, or a self-appointed guardian of good taste. The hand armed with the custard pie is emerging from a sewer pipe; need I say more? From 14 May 2018.